Brand new to the gallery we are pleased to welcome ‘The Lost Words’ print collection signed by Jackie Morris and Robert Macfarlane. Together, the artist and writer evoke the timeless essence of the natural world around us that is disappearing. Taking the form of twenty ‘lost’ words, collected alphabetically from ‘Acorn’ to ‘Wren each word becomes a spell – written by Robert Macfarlane, which is intended to be read aloud. 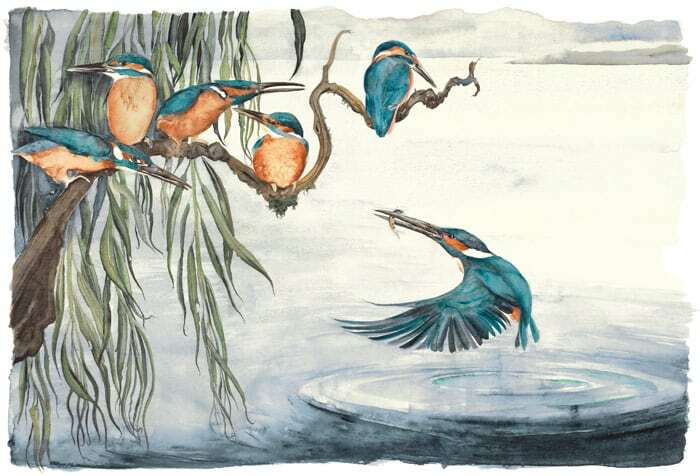 The images – painted by Jackie Morris, capture first the absence of the plant or creature within its habitat and then its return. The collection is comprised of 8 illustrations that are signed and limited to 145 prints each that can be seen in store or you can shop online here. The combination of words and art brings awareness not only to the fact that many children are spending less time outdoors but that there has been a dramatic reduction of animal species and their habitats in the UK. So come visit this new exhibition at the gallery to read some of the ‘Lost Words’ aloud and bring them to life.